The fundamental difference between a simple interest mortgage and regular mortgage is in the way the interest is calculated. With a regular mortgage, interest is accrued monthly, while with a simple interest mortgage it is daily. When interest is accrued daily, you could end up paying more that were it calculated on a monthly basis – or you could pay less. When this loan is amortized, your monthly payment works out at $787 monthly. $600 of this would be interest, leaving $187 to deduct from the principal – now $149,813. That calculation is iterated until the mortgage is paid off. Because you pay your mortgage monthly with a regular mortgage, making your payment a day or two late won’t affect it because the next lot of interest is not calculated and applied until the end of that month. Most lenders will give you a grace period before applying charges. Let’s now assume you have the same mortgage on a simple interest basis, where interest is calculated daily. The 4.8% is divided by 365 to give a daily rate: 0.13151%. This is applied daily, so on day 1 your interest is $19.73. However, your monthly payment works out the same because the annual interest is still 4.8%. The $19.73 interest is placed into a monthly account, known as an interest accrual account. That continues to increase until your monthly payment is made. It should not make much difference how your interest is calculated if you maintain your monthly payments. However, where the simple interest mortgage loses is if you pay a day or two late. Because the principal has not been reduced, the interest is calculated on your previous balance and continues to be added to the accrual account until you pay. The amount of interest due is then more than had you paid on time. Not only that, but in leap years you will be charged an extra day interest. The effect of both these factors is that it takes longer to clear your mortgage: the higher the interest rate, the longer it takes. Leap years do not affect monthly repayments. 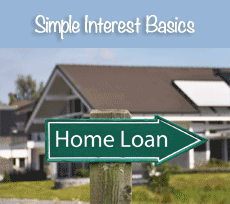 Where a simple interest mortgage is of benefit is if you make more regular payments, or make your payments early. Let’s examine these two possibilities. Some mortgage agreements allow you to make your payments biweekly. This is offered to help those that are not paid monthly to make their payments when the money is available. Normal biweekly arrangements do not apply the first payment to the mortgage until the second is also paid, and the two paid together. There is little advantage in terms of saving money. However, it is possible to get a simple interest biweekly agreement, where the payments are applied when paid. The capital reduces every two weeks rather than monthly. You then save on interest payments, and your mortgage can be paid off before the 30-year term. For early payments to work, you must come to an agreement with your lender that they will be applied when paid. If your normal payment is due for the 1st of each month, and you pay it on the 20th of the previous month, then you save around 10 days interest. This can be significant over 30 years and it is sometimes possible to pay your mortgage off a year earlier and save thousands of dollars on total interest payments. Every case can be different. Amortization of a mortgage loan is complex – particularly so with a simple interest mortgage. Still have questions? We can help you decide which mortgage makes the most sense for your specific scenario and needs.